When I was preparing for the residency at BVAR, I had a plan to make daily shrines celebrating nostalgia and memory. I brought a friend’s discarded medium format slides in case I needed inspiration. While most of the work I made in Michigan reflected my personal experiences and interactions there, I turned to the slides for one piece. Being out of context and meeting new people was at once invigorating and anxiety-producing. With this in mind, I chose slides of young people at a party for Story Street. I examined the tiny frozen moments looking for clues on how to comfortably engage in conversation. Without knowing the event documented in these images, I imagined the exchanges and wondered about the ease of social interactions. I studied the strangers’ expressions, body language, and positions. Clothing in these pictures paralleled those in my own family slides. 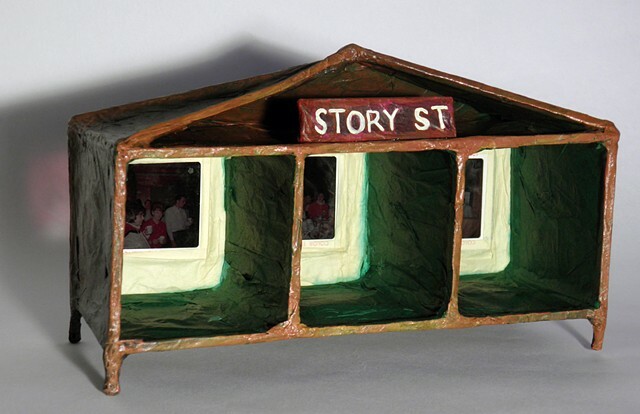 Story Street is about the commonalities we share in memory, history, nostalgia, and connection. Special thanks to Bob and Maryann Walker of St. James, NY.